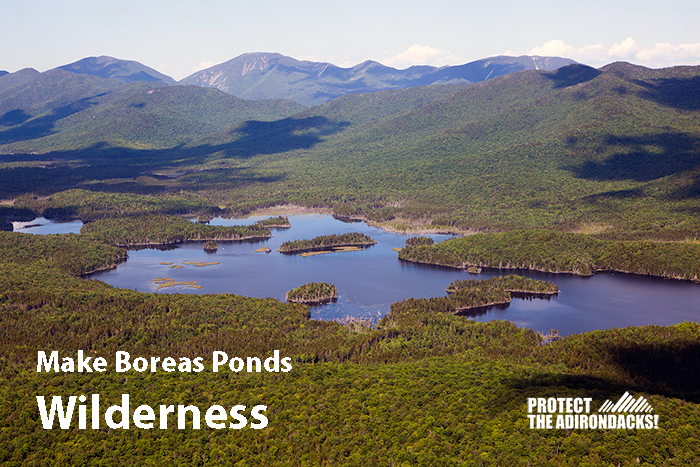 Adirondack Park Agency awaits decision by Governor Cuomo on the classification of the Boreas Ponds tract | Protect the Adirondacks! In a normal system of state government, the Governor would await a decision by his independent agency, but in the Adirondack Park today the Adirondacks Park Agency waits and waits for the Governor to make his decision. The best information to trickle out so far is that the Adirondack Park Agency (APA) will take up the Boreas Ponds classification deliberations starting at the October 2017 meeting in Ray Brook, but that it could be delayed until November. The APA has, apparently completed much of the paper work on the Environmental Impact Statement and organized its response to public comments. The APA has also organized various options for consideration by the APA Board; mostly they are similar to those taken to public hearing last fall. The missing piece is final layout of the classification of the Boreas Ponds tract that will be used as the APA’s “Preferred Option.” For that, the APA is waiting on Governor Cuomo to make the final call and tell the APA what his, and their, “Preferred Option” will be. Governor Cuomo’s preferred option faces a number of questions, which will affect the process and timing of the APA’s final decision. For instance, if the Governor decides he wants a new Intensive Use area on any of the lands in question this will necessitate a change to the EIS and a new round of public hearings. If the Governor decides to leave a blank 5-acre cutout that remains unclassified “pending classification,” the decisions on the surrounding classifications will limit what can eventually be authorized in the unclassified tract. In the Governor’s Preferred Option, a decision will have to be made for boundary lines for Wilderness, Wild Forest and Primitive classifications. These boundary lines will determine where mountainbikes, motor vehicles and snowmobiles are allowed. Ideas that remain on the Governor’s table include a spidering network of mountain bike trails that include a loop around the Boreas Ponds and a trail to White Lilly Pond. The Governor needs to decide how much, if any, of the Golf Brook Road will remain open for motor vehicles as well as the route of the Newcomb/Minerva to North Hudson community connector snowmobile trail. For each, Governor Cuomo has been given a suite of options. The Governor is also making the call on a possible Primitive Corridor for maintenance of the Boreas Pond dam and whether that same corridor will be used for CP-3 special access for disabled individuals. Another option is an Essex Chain style Primitive Area that would necessitate changes to the State Land Master Plan for mountain biking and possible public motor vehicle use. More than a year ago, state agencies promised that the decision on the classification of the Boreas Ponds would be speedy and transparent. It has been nothing of sort. The decision has been delayed, not only by the complexity of the issue and the series of tough calls the state will have to make, but also by a newfound fascination of Governor Cuomo and Basil Seggos, the Commissioner of the Department of Environmental Conservation, for building some kind of rustic residential lodging facilities on the Forest Preserve for rent by the public. It now appears that a proposal for public lodging facilities on the Forest Preserve will come after the classification of the Boreas Ponds and not as part of it given a reckoning by state officials with the legal complications of this idea. DEC Commissioner Basil Seggos insists that the APA board is acting independently, and that it’s actually the other way around — the Cuomo administration is waiting for the APA to make its classification before it decides whether to pursue the hut proposal. Basil Seggos’s comments in Seven Days strains credulity, to say the least. Unable to make a coherent and timely decision, the Governor is now sending out his key staffer to dissemble to the media and spin nonsense. In a new piece on these issues in the Village Voice, other DEC flaks had trouble keeping the story straight. If the APA really had unilateral authority to make the decision on the classification of the Boreas Ponds it would have been done already. Further, if this was the case then the APA Chairman would be able to give coherent answers when questioned by other Board members about why the APA can’t move ahead and classify the non-controversial lands, such as the MacIntyre East and MacIntyre West tracts, which border the High Peaks Wilderness area. The main impediment to the APA making a decision is the search by the Governor and DEC Commissioner for a way, any way, to legally build residential structures on the Forest Preserve to rent to the public. This idea not only violates Article XIV, Section 1 of the NYS Constitution, but also violates the Adirondack Park State Land Master Plan as well as 45 years of coherent recreational management of the Forest Preserve. The only buildings allowed on the Forest Preserve are for administrative purposes, such as the caretaker’s cabins at Lake Colden or Raquette Falls or the various buildings used by Rangers and seasonal DEC staff at Little Tupper Lake, among others. As a dutiful secretary to the Governor, the APA has a lot of paperwork to do and legal findings to finalize once the Governor makes his decision. These are complex documents and can’t be drafted overnight. Further dithering by the Governor could push the decision off until November or later, though the Governor’s staff and DEC leaders want to see the process started in October. Governor Cuomo made a series of mistakes with the classification of the Essex Chain Lakes parcel. Public use has been low compared with other places like Little Tupper Lake, Round Lake, and Low’s Lake. Rather than learning from his mistakes, Governor Cuomo appears to be doubling down on the idea that cramming a number of incongruent uses and classifications together into one discrete section of the Forest Preserve, which may also necessitate further weakening of longstanding policies, is a model worth replicating at the Boreas Ponds. Follow Protect the Adirondacks on Facebook. Follow Protect the Adirondacks on Twitter.